To understand the Fianna Fail comeback in this election you need to understand the nature of the party's relationship with Ireland. In the reams of analysis before, during and after, not just this election but also the last, the experts almost entirely lost sight of that relationship. But it was always something I was mindful of when, almost obsessively, I wrote about Fianna Fail throughout the past five years. How could one not be but fascinated by the near death and now rebirth of what was always a great political movement. Two years ago, I predicted that the party could win this election and that Micheal Martin could become the next Taoiseach. As I write now, with the noise of television, radio and internet at full blast - less than an hour from deadline - it cannot be known for certain whether that prediction will come to pass. The expectation is that Fianna Fail will fall narrowly short of Fine Gael in terms of seats won, but the inescapable truth is that Fine Gael more than any other party has lost this election. What can also be said with absolute certainty is that, although still its second worst result in history, this has been a stunning election for Fianna Fail. The headlines will state that Fianna Fail is back, but the truth is that it never went away, and the further truth is that it never will. The election outcome will show us that, yes, the political landscape has changed and changed utterly, which is not to be feared, but to be warmly welcomed. The arrival in that landscape of new parties and the triumph of Independent candidates across the spectrum can only be healthy in a thriving democracy. What is clear from this election, however, is that Fianna Fail has and will continue to re-establish itself in this new, modern Ireland. In my view, that was never in doubt, whatever the view of naysayers who predicted the demise of a once great political movement. The residual greatness of that movement was evident in its result this weekend, but how did it happen? That's simple. The rebirth of Fianna Fail can be vested in the leadership of Micheal Martin - as I said last week - who has now become a relative political phenomenon. The scale of the task which confronted him after the last election can not be underestimated. He was under attack on all sides and from within: Fine Gael to his right, Sinn Fein to his republican left and some in his own parliamentary party also had him in their sights. It is a testimony to his remarkable fortitude that he never wavered from the path upon which he had put Fianna Fail. His most skilful awareness was to realise that the centre ground of Irish politics had moved to the left at a time when Fine Gael had moved to the right. In positioning Fianna Fail to the centre-left, Martin in effect returned the party to its traditions, where most Fianna Fail people I know are most comfortable. "They just don't listen," he repeatedly said of Fine Gael before and during the election campaign, and he was correct in more ways that one. Fine Gael introduced five regressive budgets in a row, but what Fine Gael did not hear - because it did not listen - was that the economic crisis had moved the centre of Irish politics to the left. This achievement in itself does not entirely explain the comeback of Fianna Fail in this election. As I have also repeatedly said in recent years, around a fifth of Fianna Fail support abandoned the party in the last election. 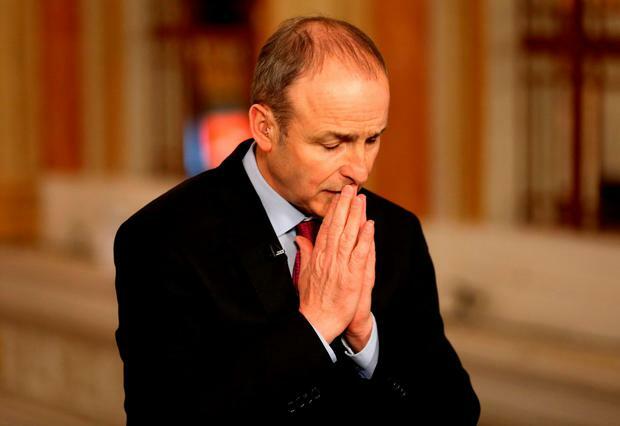 That support went primarily to Labour, where it always does when the electorate wants to punish Fianna Fail. The extent of voters' reaction to the economic boom also gave rise to something which had never happened before: a sizeable chunk of Fianna Fail voters also loaned their votes to Fine Gael last time. It was always my view, and now it turns out that it was delusional of Fine Gael to believe those borrowed votes would stick, recovery or no recovery. As I have written at least twice in the past few years, the reasons for this are far deeper than most standard analysis offers. It is said the origin of the divide between Fianna Fail and Fine Gael goes back to the foundation of the State. In this regard, I am reminded of the famous Bill Shankly quote, that some people believe football is a matter of life and death: "I am very disappointed with that attitude. I can assure you it is much, much more important than that," Shankly said. The origins of the divide between Fianna Fail and Fine Gael are more profound than those which emerged after the civil war. Historians have argued it goes back further than that, to the different traditions linked to the arrival in Ireland of Anglo-Norman and new English to clash with the 'native' Gaelic people. Fianna Fail is the embodiment of that native spirit; it is entwined in the DNA of our people. In a way, Fianna Fail is Ireland and Ireland is Fianna Fail. That is what needs to be understood, first and foremost - and above all other issues - when we come to examine the result of this election.